Many generations of family Cattunar are rooted in the terroir of western Istria. Franco Cattunar’s grandfather (Anton) was one of the owners of communal winery in Brtonigla before Second World War and his father was a grower. Franco Cattunar, founder and owner of Wines Cattunar, entered the familiy busniness 1985. as one of the first private growers and winemakers in Croatia during communist rule that until it’s crumble in the 1990s never encouraged private enterpreneurship. Since the late 80s’ to present time, Cattunar family estate constantly expanded. Sprawled over 56 hectares today, their are probably the largest privately owned vineyards in Istria. The wine production of western Istria and Brtonigla area is so deeply rooted in history and the spirit of it’s inhabitants, that it’s legendary. 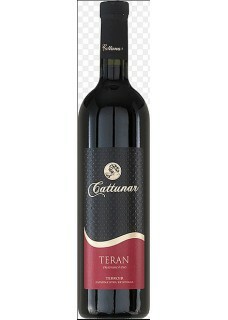 Teran is an old autochthonous Istrian grape variety and is of great importance to the local people who know it as an elixir. The wine is characterized by intense dark red colour and is an acid driven wine having an aroma of maraska (a type of wild cherry). Due to maturation in oak barrels, fragrances of plum and cherries jam have been formed. It is warm and fresh in the mouth, with soft tannins, great structure and complexity. Long lasting taste gives the impression of great finesse and balance of the wine.